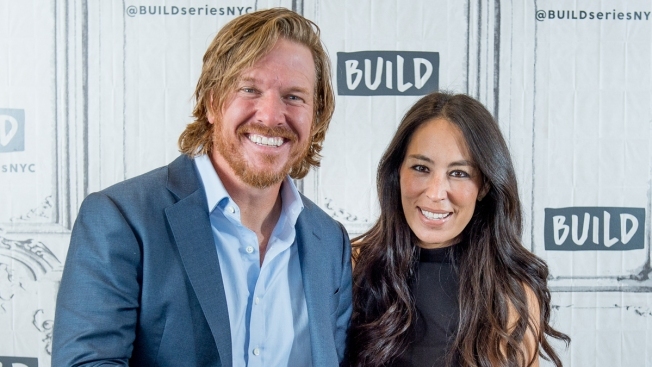 The EPA says it reviewed video footage from several seasons of "Fixer Upper"
This Oct. 18, 2017, file photo shows Chip and Joanna Gaines discuss "Capital Gaines: Smart Things I Learned Doing Stupid Stuff" and the ending of the show "Fixer Upper" with the Build Series at Build Studio in New York City. They settled with the U.S. Environmental Protection Agency on allegations that they used inadequate protection while removing lead paint during renovations, it was announced on Tuesday, June 5, 2018. Chip and Joanna Gaines, stars of HGTV's "Fixer Upper" series, have settled with the U.S. Environmental Protection Agency on allegations that they used inadequate protection while removing lead paint during renovations. Under the deal with the EPA, Magnolia Waco Properties LLC, doing business as Magnolia Homes, will ensure compliance with lead-based paint regulations in future renovations. It also promises to educate the public on lead-based paint hazards. In a statement Tuesday, the EPA says it reviewed video footage from several seasons of "Fixer Upper." EPA says it found violations of regulations governing lead-based paint exposure. Magnolia also has agreed to pay a $40,000 civil penalty and spend $160,000 to abate lead-based paint hazards in homes and child-occupied facilities in Waco.